Published in 1846, Mosses from an Old Manse, by Nathaniel Hawthorne is a collection of allegories. 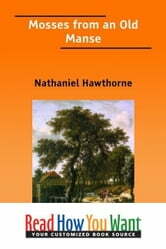 The book is named after The Old Manse, where Hawthorne and his wife lived for the first three years of their marriage. This aggregation of short stories contemplates the limitations of human imagination. The work brings out Hawthornes fascination with the elusive nature of evil, his mistrust of progress, his disdain for moral absolutism, and his puritan heritage.